Some might say she is inspired by 15-year-old activist Malala Yousafzai, who was the victim of one of the many attacks on hundreds of schools in the northwest region of Pakistan — simply due to the fact that Taliban militants oppose girls’ education. 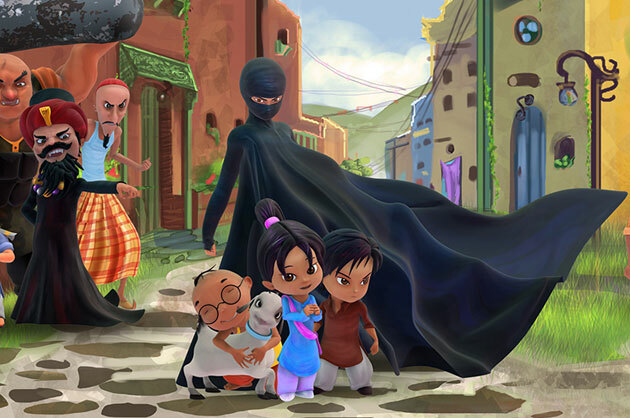 While appropriately dressed in a concealing and ninja-like burka to hide her true identity, the Burka Avenger is a passionate schoolteacher named Jiya by day, who also happens to fight the town’s thugs and politicians who are on the prowl to shut down the girl’s school in which she works. Unlike the costumes we normally see on female superheroes in the West, the choice to dress the first female superhero in a black burka is sure to raise questions and oppositions due to the history and stigma associated with wearing a piece of clothing that has been forced upon women when the Taliban took control of Afghanistan in the 1900s. In the short trailer presented on the website, opening scenes introduce the town of Halwapur, Pakistan, a fictional town that is presented with citizens who are bursting with energy and life. This harmony is disturbed when a corrupt politician named Vadero Pajero and an evil magician named Baba Bandook, whose long beard insinuates a resemblance to the Taliban, aim to shut down the girls’ school in Halwapur. The scene cuts to thugs who are advancing on young children with threatening hand gestures until you see a figure in black jumping from the top of a building — you might even think it’s Batman! But it’s the Burqa Avenger, who uses her martial arts skills as well as books and pencils as her weapons to fight against the evil that has been brought to her town. It is obvious that the targeted audience is not a Western one but it caters to specifically Muslim/Desi and mainly Pakistani audience. This refusal to cater to the Western gaze makes this show unique due to the fact that this is meant to inspire and encourage Pakistani youth, especially young girls to fight for what they believe in and their education in a time where Taliban members have went as far as shooting young women for attending school. Through this family friendly cartoon, it is made obvious that many citizens in Pakistan do not agree with the extremist ideas and fear that the Taliban instills. This narrative challenges the presumptions under which imperial feminism operates because of how Muslim women are often portrayed in the media and through Western feminist groups such as FEMEN. The fact that Muslim Pakistani women are empowered and able to take matters into their own hands means that they are able to find strength and their own feminist ideals by turning a piece of clothing that has been used to oppress women into a source for their own empowerment. It also dismantles this nothing of a foreign savior or intervention being needed in order to liberate these women because the Burka Avenger is able to save herself as well as inspire young women in her city by helping take back the young girls’ school. The “Burka Avenger” is set to premiere on Geo TV in the next few weeks in early August, this family friendly show is a lighthearted action-comedy cartoon with lessons to offer each episode. In a music video featuring the voice of creator Haroon Rashid and local rap star Adil Omar, they sing praise and warn evildoers to take caution of the Burka Avenger, while standing in front of a pair of colorfully Pakistani trucks traditionally decorated with lights.